Several proposals for a state highway system were put into place before the first defined system in 1926. This is a 1919 proposal for the state highway system. Notice that what became US 66 did not exist east of Holbrook toward Lupton. Courtesy of the Arizona State Library and Archives. This was a proposed 7% Federal highway system. Notice the limited primary highway network, with most of the state routes designated as secondary highways. Courtesy of the Arizona State Library and Archives. This map is unique as it has the state highway system as it was first defined. 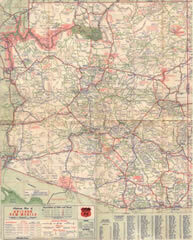 The route numbers shown on this map were all changed in October 1926. 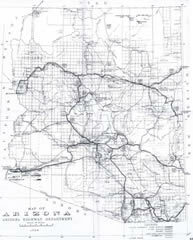 Map courtesy of the Arizona State Library and Archives map room. This map reflects the changes made in October 1926, the largest being the renumbering of US 60 as US 66. 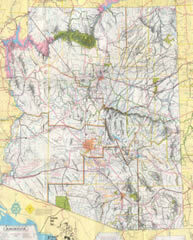 Map courtesy of the Arizona State Library and Archives map room. 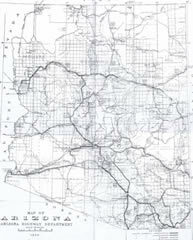 1928 official Arizona Highway Department map. Map courtesy of the Arizona State Library and Archives. 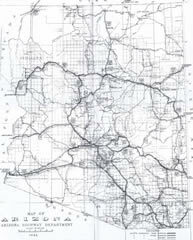 1929 official Arizona Highway Department map. 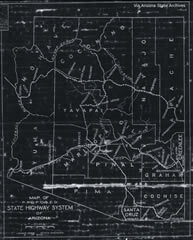 Map courtesy of the Arizona State Library and Archives. 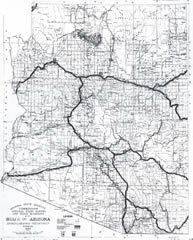 This 1930 map was included in Arizona Highways. Map courtesy of the Arizona State Library and Archives. 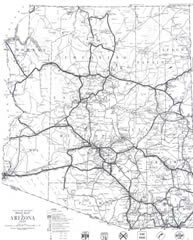 This 1931 map was included in Arizona Highways. Map courtesy of the Arizona State Library and Archives. 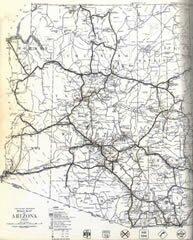 Map from the March 1932 edition of Arizona Highways. Map courtesy of the Arizona State Library and Archives. 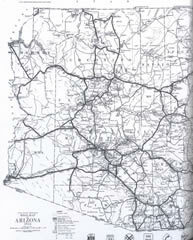 1934 map from Arizona Highways. Map courtesy of the Arizona State Library and Archives. 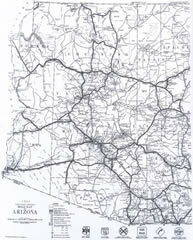 1935 Arizona Highway Department official map. Map courtesy of the Arizona State Library and Archives. 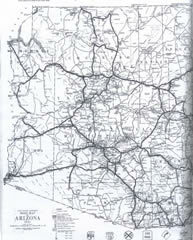 1939 map included in Arizona Highways. Map courtesy of the Phoenix Public Library. 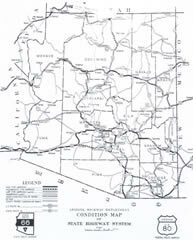 This 1940 map in Arizona Highways. Map courtesy of the Phoenix Public Library. 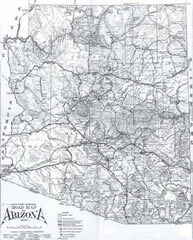 1941 map printed in Arizona Highways. Map courtesy of the Phoenix Public Library. 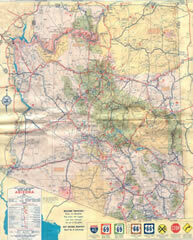 1942 map printed in Arizona Highways. Map courtesy of the Phoenix Public Library. 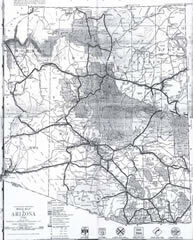 This 1943 map was included in Arizona Highways. 1946 Arizona Highway Department official map. Map courtesy of the Arizona State Library and Archives. This 1951 map is taken from a H.M. Goshua Arizona/New Mexico Map, distributed by Phillips 66. 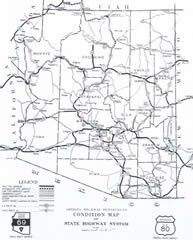 1958 Arizona Official Highway Map, with cartography by Rand McNally. 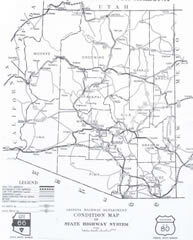 1963 Arizona Official Highway Map, with cartography by Rand McNally. 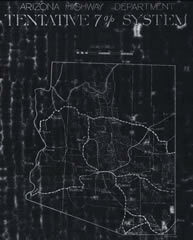 This was the last edition that the state used Rand McNally cartography - in 1964, Arizona started producing their own maps for public distribution. 1971 Arizona Official Highway Map, with cartography by the Arizona Department of Transportation.